If you end up on a website claiming to be the relaunched KNC Miner trying to sell you a new Scrypt ASIC miner dubbed Titan 2.0, then you should know that this is not a website related in any way to the new owners of KNC Miner after last year the company went bankrupt prior to the last halving of Bitcoin (BTC). 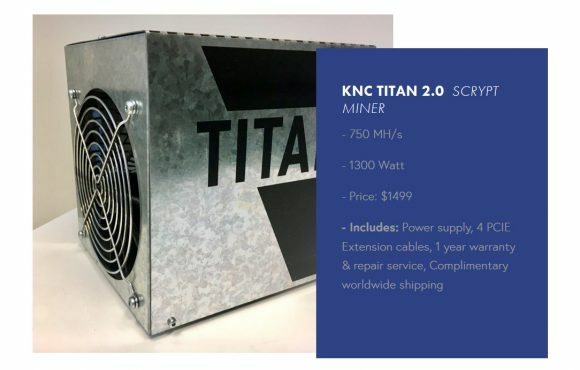 The KNC TITAN 2.0 miner promises to deliver 750 MHS Scrypt hashrate at 1300W power usage and a ready for mining kit including a power supply is being advertised with at price of $1499 USD, but it seems that this is not an actual product and just a convincingly looking SCAM trying to steal some of your hard earned coins (accepted payments are only in crypto – BTC, LTC, ETH, STEEM or XRP). So stay away and do not get mislead by the seemingly good offer, it is simply not real! If you want to get an up to date specification wise Scrypt ASIC miner for mining Litecoin (LTC) or other crypto currencies, then you should go for either Innosilicon A4 Dominator or the more recently announced Bitmain AntMiner L3+. Both of these are confirmed actual products and work just fine for Scrypt mining, though you should still be careful where you buy your mining hardware if it is not directly from the manufacturer! The recent spike in the price of Litecoin (LTC) has sparkled more attention to the altcoin and as a result the number of people trying to profit at the expense of regular users have also increased, so it is advised to be careful what you do with your hard earned crypto coins. It is a scam, KNC will never be trusted again, ever, no matter what they call it or how they rebrand it. Thieves, cheats, and they hid from justice. I got 2 Antminer L3+’s 2nd batch ordered threw bitmain themselfs. Very happy. Should be here in July. I agree but another big Scam Is Ante Kelava he stole millions now he is behind Firstcion another pump and dump.